The debate over the effectiveness and use of mammography has been raging for more than two decades. Although mammograms are often promoted as an insurance policy against breast cancer, screening has potential risks as well as benefits, and the evidence shows that overall, mammograms harm more women than they help. As I’ve written previously, the decision about whether it’s worth it to undergo a test that’s much more likely to result in a false alarm or unnecessary treatment than to save a life is a value judgment, not a scientific one. Concerns about the risks to women led two of the most prominent organizations that offer recommendations on screening to advise doctors to discuss them — rather than automatically suggest screening — with patients in their 40s. But the results of a survey being reported today in the journal JAMA Internal Medicine suggests that many of these women might never get a chance to weigh the pros and cons. The national survey of 871 physicians asked whether they usually recommend screening mammograms to women who have no family history of breast cancer and who have no known breast problems. The researchers found that 81 percent of physicians recommended screening to women ages 40 to 44 years and that 88 percent of them recommended the tests to women ages 45 to 49 years. Family physicians and internal medicine doctors were less likely than gynecologists to tell women ages 40 to 49 to get a mammogram. And among those three groups, gynecologists were the most likely to recommend the tests for all women over 40. The U.S. Preventive Services Task Force, an independent panel of experts on prevention and evidence-based medicine convened to conduct scientific evidence reviews, recommends that doctors work with patients ages 40 to 49 to make personalized screening decisions, and the American Cancer Society’s guidelines make a similar recommendation for women ages 40 to 44. In contrast, the American Congress of Obstetricians and Gynecologists advises yearly mammograms for all women 40 and older. 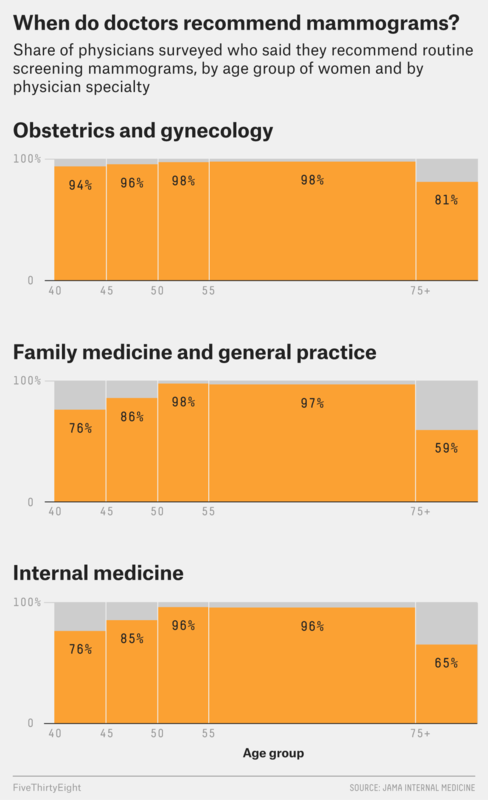 The survey asked the doctors which of those guidelines they trust most. Trust was fairly evenly split among ACOG guidelines (26.0 percent), the ACS guidelines (23.8 percent) and the Preventive Services Task Force (22.9 percent). But the doctors didn’t necessarily pass their most trusted guidelines on to their patients, said Dr. Archana Radhakrishnan of Johns Hopkins, the study’s lead author. 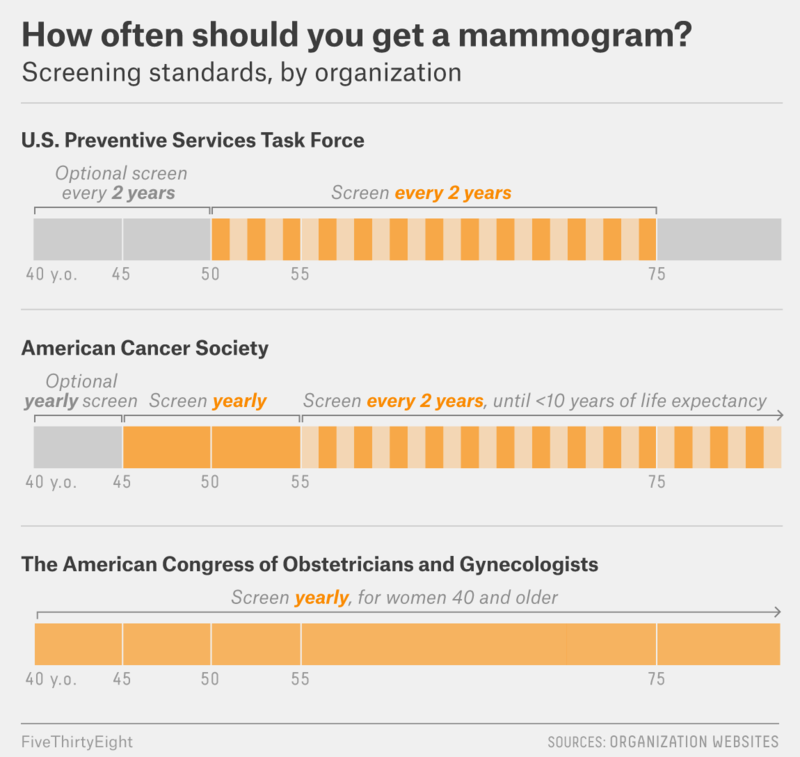 “Providers are saying, ‘I trust these guidelines,’ but then recommending screening mammography that’s not recommended by that guideline.” That almost half the respondents said they trusted the ACS or task force recommendations isn’t reflected in the 81 percent that recommended screening to women ages 40 to 44, implying that some are giving advice contrary to them.